In major cities across the world, traffic congestion is at an all-time high. A study by the analytics company INRIX revealed that drivers in Los Angeles spent more than 100 hours in traffic jams in 2017, more than in any other city in the world. And this comes at enormous economic costs as well, with congestion costing the U.S. roughly $305 billion due to lost productivity, increased cost of transporting goods, wasted fuel, and environmental effects. The hope has been that ride-hailing services like Uber and Lyft would help fix congestion problems, but a study by the UC Davis Institute of Transportation Studies suggests otherwise. The adoption of ride-hailing has led to 2.8 new vehicle miles on the road for each mile of personal driving removed, for an overall 180% increase in driving on city streets. While traffic worsens, one of the few existing solutions to congestion—public transit—is seeing some of the lowest ridership rates in recent history. 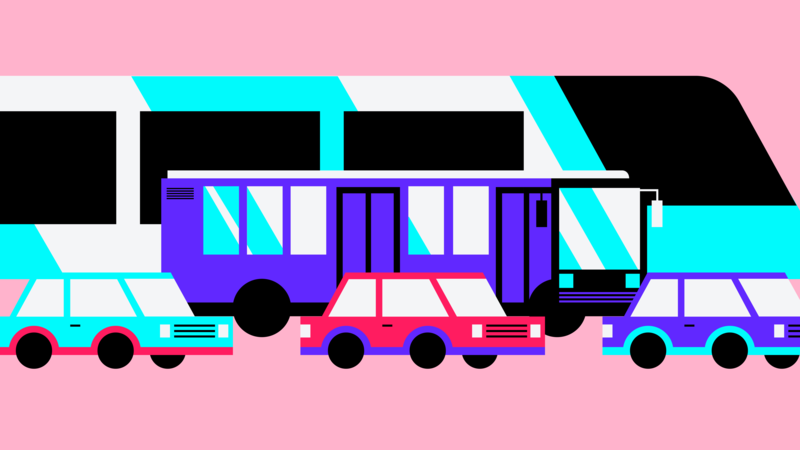 Aging networks and slow service are pulling riders away from buses and trains and into personal cars and ride-hailing services. Some cities, such as Altamonte Springs, FL, have partnered with Uber to replace public transportation with subsidized Uber rides. But as ride-hailing studies have shown, this is only going to worsen congestion, not make it better. By focusing on a human-centered approach to mobility that embraces technology and fosters collaboration amongst different parties, we can create a future in which it is easier, faster, safer, and less expensive to move throughout a city. There are a variety of emerging solutions that, along with existing options, represent great opportunities to improve mobility and congestion. Historically, it has been difficult to predict when public transportation will arrive and how long the trip will take, with buses and trains often running chronically behind schedule. And large, well-established transit systems are not free from this pitfall - 35% of subways in NYC arrive late, causing a great deal of frustration for riders. Many cities are starting to include tracking in their public transit so that riders can see real-time data on when their bus or train will arrive. Studies have shown that data on when a bus or train is coming can decrease perceived wait time and increase ridership. Companies like Moovit, Whim, and TransLoc are working to help transit agencies make this data accessible and also more accurate by taking into account weather, traffic, GPS, and historical data. Waiting can also be improved by creating better transit stops, such as a stop in Singapore that has WiFi, books, a journey planner and ticket purchasing. Making the wait more enjoyable and productive can also make the delay seem shorter, leading to happier (and more) transit riders. Even when waits are more enjoyable, it is ideal to keep their length as short as possible. One of the biggest things that slow down transit is the time it takes for people to get on and off, especially if they have to purchase tickets when they get on. Widespread adoption of mobile ticketing and ticketing stations outside the vehicle could greatly reduce boarding time and also allow for multi-door boarding, which would help reduce overall travel time and also improve reliability. Every mobility option, whether public transit, ride-hailing or bike sharing, has its pros and cons and situations in which it is the best option for an individual. But these systems are all disparate, and it can be difficult for someone to figure out which option is best for them or piece together a trip with multiple transit modes. This is where Mobility as a Service (MaaS) comes in to ease the difficulty of planning a multi-modal trip. MaaS integrates both public and private transport options so that someone can see all the alternatives for getting from point A to point B, as well as book and pay for all their tickets in one place. This type of aggregation and visibility empowers people to choose the option that best meets their needs, whether it’s getting there faster, cheaper, or in a more environmentally friendly way. These services can also assist those with disabilities to find modes of transport that will be most accessible for them. While MaaS currently deviates from how mobility services are navigated in most cities, there are places where this is already working. Whim is an app that has been available in Helsinki since 2016 and enables users to plan their trip and purchase tickets across public transit, taxi, car service, and city bike. Users can either buy a subscription for unlimited access to all the transit options or pay as they go for whichever mode they choose. By making it easier to plan a trip on shared transit, MaaS apps like Whim can encourage people to get out of their cars and get around the city in ways that help cut down on congestion. We are on the brink of a mobility revolution, and if we want to avoid roads snarled with traffic, we will need to be proactive in implementing mobility solutions. Public transit will be a key part of these solutions, but it is a large, slow-moving industry that can be difficult to implement change within. But it doesn’t have to be this way. Public transit companies can launch Beta Businesses that allow them to test smaller scale, experimental services. A transit agency could launch an autonomous vehicle pilot or on-demand service to a subset of their service area. This could be done faster, at lower cost, and with less risk than if they tried to roll out to their entire rider-base at once. Then it can be tested and iterated, and once it is proven as a viable solution, it can be integrated into the more extensive transit system. We also see numerous opportunities to introduce moments of delight into the often frustrating experience of riding public transit. By talking to directly to users of transit and mapping their journey, we can uncover the largest pain points that are involved and then transform them into moments that positively define the experience. These signature moments could be as simple as getting a notification when you need to leave to catch your bus on time, or as large as a smart “transit assistant” that automatically suggests faster routes personalized to your travel behavior. There are opportunities to wow the user before or after they are even on a train or bus. For instance, interactive displays at transit stops to help plan journeys and show real-time arrival information. Or provide recommendations for nearby things to do while you wait for your train. As the MaaS solutions show, being able to plan a trip from end-to-end before even leaving home can also make the transit experience feel more seamless and lowers the barrier to entry. For all of these solutions, it is critical that we involve the people who live and travel on our streets when planning mobility solutions, because only by focusing on the needs of people will we be able to create reliable and flexible mobility options that everyone wants to use. This is exactly the type of work that Idean has expertise in - going out into the field to talk with actual users and creating delightful user experiences that meet and exceed the needs that we uncovered. We are excited to be a part of the future of mobility by creating innovative solutions that reduce congestion and in turn, save individuals and societies enormous amounts of time and money every day.